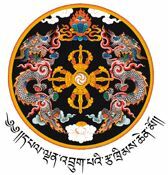 The State shall strive to promote those circumstances that will enable the successful pursuit of Gross National Happiness. The only strange thing about he site, other than that it uses language like "luminous benedictions of the Triple Gem", which I'm not sure what exactly means, is how the people who wrote it seem very worried about copyrights. The draft constitution is copyrighted and all rights reserved by the drafting committee. And they've gone to some length to make it difficult to examine the source of the webpages or to copy the text or the pictures. Which doesn't seem to quite go together with the spirit of that constitution. is the process of taking refuge from the suffering of life in the world. The threefold gate is the Buddha, the Dharma, and the Sangha. http://www.accesstoinsight.org/lib/thai/lee/triplegem.html You're probably looking at a theocracy here, Ming. I suppose it would be. Although it seems like they're planning for it to be a fairly voluntary democratic one. Thanks for clearing up what it means. We, the people of the United States, in order to form a more perfect Union, establish justice, insure domestic tranquility, provide for the common defense, promote the general welfare, and secure the blessings of liberty to ourselves and our posterity do ordain and establish this Constitution for the United States of America. Seems like Bhutan has taken something from us. Do autocratic government also writes constitution for people's right, liberty and justice. What is your constitution talking about justice???????. It was just the hypothesis that India tried to dissolve rumor regarding the secret diplomacy with Bhutan.